Imagine a long hike and having access to an ice cold drink, hours after you have left civilization. Alternatively, the tumbler keeps beverages hot for 12 hours, as well. 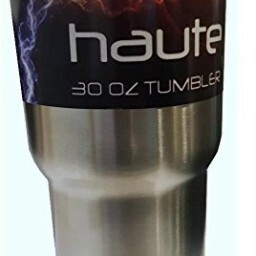 Haute Tumblers are 30 oz and feature 18/8 stainless steel construction with double walled vacuum insulation. This ensures that your drinks stay hot or cold for extended periods of time. This product was extensively tested and was proven to keep ice in the tumbler for 24 hours with minimal melting. Imagine a long hike in the great outdoors in the sweltering heat, and having access to an ice cold drink, hours after you have left civilization. Alternatively, the tumbler keeps beverages hot for 12 hours, losing only a few degrees of heat after that amount of time. The hard plastic lid is clear, shatterproof, and BPA free. There is also extra room in the opening of the lid for a smoothie straw, making the this tumbler extremely versatile. The Haute Tumbler fits into your car cup holder, or comfortably right into your hand. The sweat free design guarantees that there is no wet residue left on your hands after handling the tumbler, which allows for a seamless transition between taking sips and any other task at hand. Please note that the Haute Tumbler is NOT dishwasher, microwave, freezer, or oven safe. Please only clean with mild soaps and cleansers.